1- I purchased 400 shares of Steel Dynamics (STLD) @ $36 per share for a total cost of $$14,406.75 after commisssions (so small, commissions are a non-event). 2- I sold 4 contracts of the May $35 call options (in-the-money strike price). 3- This generated $951.02 cash into my account in seconds! 4- I purchased 100 shares of Weatherford (WFT) @ $80.71 per share for a total cost of $8076.65 after commission. 5- I sold 1 contract of the May $80 call option (slightly in-the-money strike). 6- This generated $353.29 into my account, once again, in seconds. 7- The total premiums collected were $1303. 8- Since I sold in-the-money strikes, I will more than likely lose money on the sale of the stocks. I will deduct this amount. I bought STLD @ $36 and agree to sell for $35. The loss is $1 per share times 400 shares or $400. WFT was purchased for $80.71 and will be sold for $80 or a loss of $71 for the 100 shares. Total loss on the sale of the stock is $471. Deduct this amount from the $1303 and that gives us a final profit of $832, meeting my $800 target. This, by the way, represents a 3.7%, 3-week return (3 weeks until these options expire)! 9- Here is the check I wrote to my real estate corporation seconds after generating this profit into my brokerage account. Now, is it that simple and easy and guaranteed? The answer is no, not yet anyway. You must learn and firmly nail down all the principles involved in selling stock options. For example, if the values of STLD and WFT decline below the strike prices, your profits will be affected. This is where you need to be prepared with your exit strategies. I devoted an entire chapter of my book, Cashing in on Covered Calls, on this very topic (see chapter 11). Also, in my workbook, pages 53 to 73 is replete with real life examples on how to invoke exit strategies. Although there is some risk in this system, it is considered so safe, that the government allows you to employ it in your self-directed IRA accounts! Don’t be afraid of the stock market…it is NOT rocket science. We may have been brainwashed into thinking that we are not capable but that can’t be further from the truth. 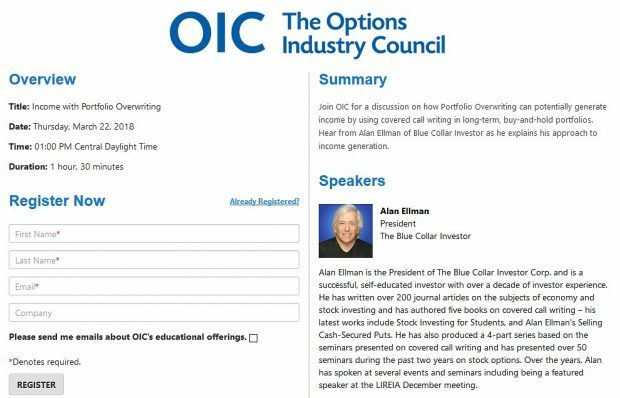 Blue Collar Investors like you and me are smart enough, motivated enough, and just as capable as those Wall Street Insiders. Wishing you all the best in investing. ***** Best 1-week performers: Hit the “comments” link of this article to see 5 of the top performing industries and some of the best stocks within those industries for the week ending 4/25/08. *Use this information in conjunction with all other rules and criteria of our system. If these companies are on your watch list, the splits will affect the next ( not the current ) contract period ( ending June 20th). Information on how splits affect your option contracts can be found in Chapter 17 of my book, Cashing in on Covered Calls and on pages 144-146 of my seminar workbook. I understand CC and generating monthly income. But not able to understand how you would transfer that profit to your realestate corp? Is this trading account in the name of and as part of your realestate corp? I appreciate your response. Thanks. These are separate accounts. The purpose of the series of articles is to demonstarte how to utilize one asset class (stocks) to support another(real estate). I set up a non-sheltered brokerage account to generate this monthly cash flow of income and write a check prior to the due-date of the property mortgage and transfer the cash to my RE account. There is nothing wrong with taking a tax loss on RE investments. However, as an avid RE investor myself, with multiple properties in several states, CASH FLOW is a critical concern. This strategy will generate the needed cash immediately. Your accountant can best tell you the most appropriate way to handle your unique situation but if you need immediate cash, why not consider cc options? I will discuss this with my accountant/cpa. Yes, I have been doing CC for some time now but never concentrated on investing. But since late last year I have been spending lot of time in reading and investing (CC). I am pleased with the results I am getting. Again I appreciate you response. Thanks. Alan – very interesting; and you make a good point about using options to cover cash flow losses on property. I see this article was written 3 years ago when the premiums were much higher – what is a realistic monthly target return today? Option premiums can be controlled by the type of underlying security and the current implied volatility of the option. I avoid highly volatile stocks and target a 2% – 4% monthly return in normal market conditions (2008 was not normal market conditions!). If you master the system this is an achievable goal. Very good way to cover RE cash flow shortages. To the poster above balu, if the RE loss is beneficial to you for taxes, you will still have it. You just use the CCs to make up for the negative cash flow. Alan, are you using next month expirations? It seems that you would need to be, if you are counting on the money regularly to make up for the RE CFs. Can you get enough premium one month (or less) out? I almost always use 1-month expirations as they generate the highest annualized returns. Once the covered call trade is executed, management kicks in. I no longer need to use covered calls to cover my shortfalls but this strategy got me through some challenging times.